Price shouldn't be indicative of quality... but for some reason, plenty of people associate the cost of a dish with its quality. That's correlation, not causation! I understand that higher costs are, in many cases, driven by the difficulty of preparation, or the cost of ingredients, but in the case of something as simple as fried pork, curry sauce, and rice, where neither preparation, nor ingredients can be considered extravagant... I think what I said is pretty reasonable. Case in point, the katsu curry at 咖哩屋 (Curry House). 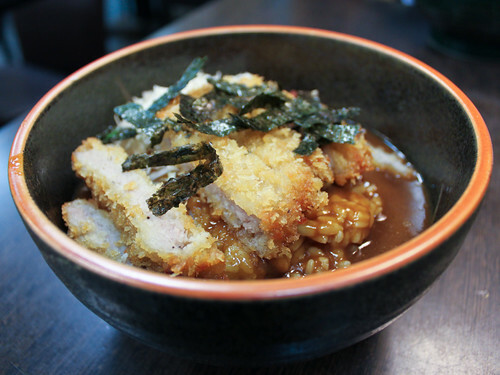 Finding a katsu curry in Taiwan is damn easy. Every better or worse, every Japanese restaurant has it on their menu. Finding a good katsu curry in Taiwan... is not as easy (although not impossible). When I happened upon 咖哩屋, located next to an 'adult entertainment' shop of all places, I don't think I was expecting anything great. I just wanted something super cheap and filling. When I saw katsu curry on their menu for 70 NT (a smidgen over $2), I was prepared for mediocrity. It seemed impossible that the cost of their katsu bowl was less than an individual piece of katsu pork in NYC. When I tried it though, the flavor was surprisingly full. With a curry that's both subtle in sweet and spiciness, their sauce is basically liquid crack. Easily worth its own weight in gold. The katsu is pre-fried, but with a quick second frying, comes out crispier than ever, preserving a vast majority of the succulent pork juice. In summary? Nice crispy cutlet and a sauce to die for... for $2. How sick is that? Is it the best I've ever had? Probably not... but because it's $2, and isn't that far off from the places that charge 300+ NT, it's a place to I've been to time and time again. unghh I envy your for your serendipitous discovery. I must find this place in Taiwan someday T.T Japanese curry is my absolute favorite and who could resist pork deep-fried in crisp panko, eggs, and flour?!?! To be fair... it's not out of this world amazing, it's just... good is all.